just play, have fun and enjoy the game! Brrrrrr the winter season is coming! Registration is now open for our winter volleyball programs. Only a few spots left. This entry was posted in Latest News on November 23, 2017 by admin. This entry was posted in Latest News on September 11, 2017 by admin. One team spot open for Monday nights Coed 6’s 8pm to 10pm at Trinity. Two team spots Wednesday night Coed 6’s 8pm to 10pm at Trinity. Both leagues Intermediate level. 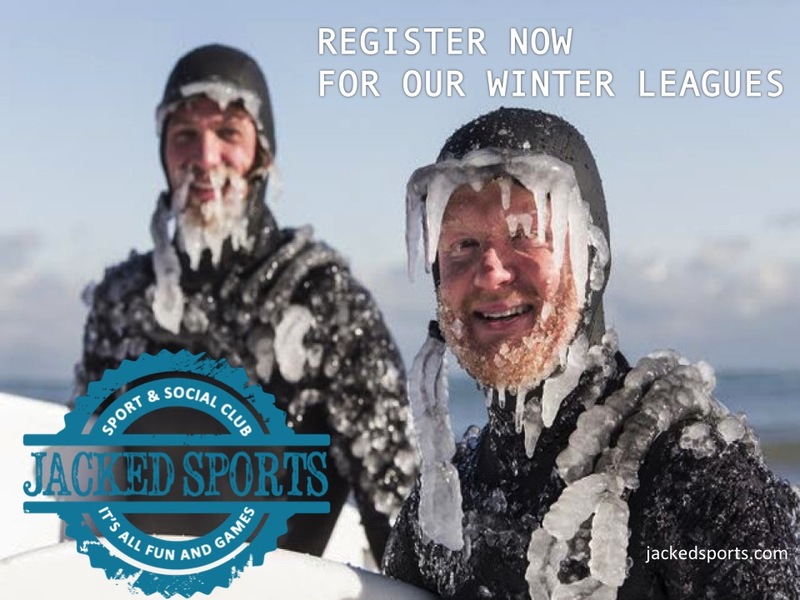 Email info@jackedsports.com to join. Leagues start September 18th. This entry was posted in Latest News on August 31, 2017 by admin. This entry was posted in Latest News on June 27, 2017 by admin. Yes, Mother Nature did it to us again. The good news is the bars are still open. Head to Uptown Tavern tonight for a little live entertainment or QB’s to watch a game and enjoy the best chicken wings in town. Stay dry and stay warm. See ya next week. This entry was posted in Latest News on May 25, 2017 by admin. This entry was posted in Latest News on April 5, 2017 by admin. This entry was posted in Latest News on March 9, 2017 by admin. 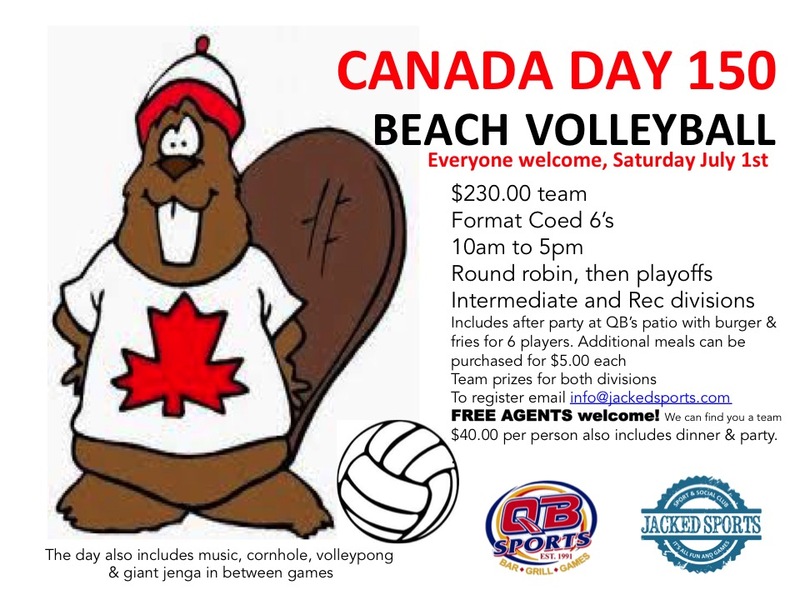 Summer Beach Volleyball is almost sold out. We Look forward to seeing so many returning teams in May. If you have not registered your team then see the list below for open team spots. If you are an individual looking for a team then please contact us and we will do our best to find you a team. Saturday – full day rentals available for tournaments. This entry was posted in Latest News on March 5, 2017 by admin. Join us once again for pick-up volleyball, but this time with a festive twist! All skill levels welcome. Teams are randomly picked and play games to 25. For the second hour, we switch em up! All participants must sign a waiver when they arrive. Dymond’s Social Kitchen & Bar or Turtle Jacks Muskoka Grill. Check our website (www.jackedsports.com) for the latest food and beverage promotions. This entry was posted in Latest News on December 12, 2016 by admin. Get your foursome together for our next social event. Saturday November 26th at Faraway Greens 7pm to 10pm. 9 hole scramble format plus skill competitions. $140.00 per team, includes 9 hole competition, skill events and one pizza per team. 19th hole on site for those of you that require aiming juice. This entry was posted in Latest News on November 9, 2016 by admin. Our motto is to not send you annoying daily newsletters to fill your inbox. We will plan to communicate monthly with great info and get right to the point. Your time is valuable and so is ours. Oh and of course... for when you have had enough fun, a convenient unsubscribe option! © Copyright 2014 Jacked Sports.